Anemometer is mainly used in Electric Power, Iron and Steel, Petrochemicals, Energy andother Industries. Measurement: m/s, km/h, ft/min, knots, miles/H, Temp. As a prominent solution provider we are engaged in broad assortment of material testing instrument. Hot Wire Anemometer is a complex and delicate instrument, its durable structure will allow many years of use if proper operating techniques are developed. This is to be used for HVAC Applications and Air Ducts. Matching up with the ever increasing requirements of the customers, our company is engaged in providing Hot Wire Anemometer. We are one of the accredited suppliers, distributors, wholesalers, traders, retailers, importers and exporters of Hot Wire Thermo Anemometer. In tandem with international quality standards, our range has alpha numeric display. Moreover, our offered range of instruments has electro-magnetical compatibility. HTC AVM-08 Hot Wire Anemometer. 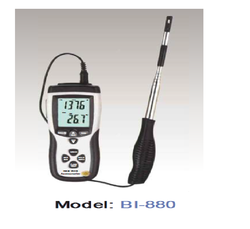 - Thermal anemometer, available forvery low air velocity measurement. - Slim probe, ideal for grilles &diffusers. - Combination of hot wire andstandard thermistor, deliver rapid andprecise measurements even at low airvelocity value. 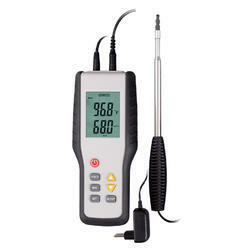 - Thermal anemometer, available for very low air velocity measurement. - Slim probe, ideal for grilles & diffusers. - Combination of hot wire and standard thermistor, deliver rapid and precise measurements even at low air velocity value. Ambient Temperature: 5 to 125 Degree F (-15 to 51 Degree C). Weight: 12.8 oz (362 g).